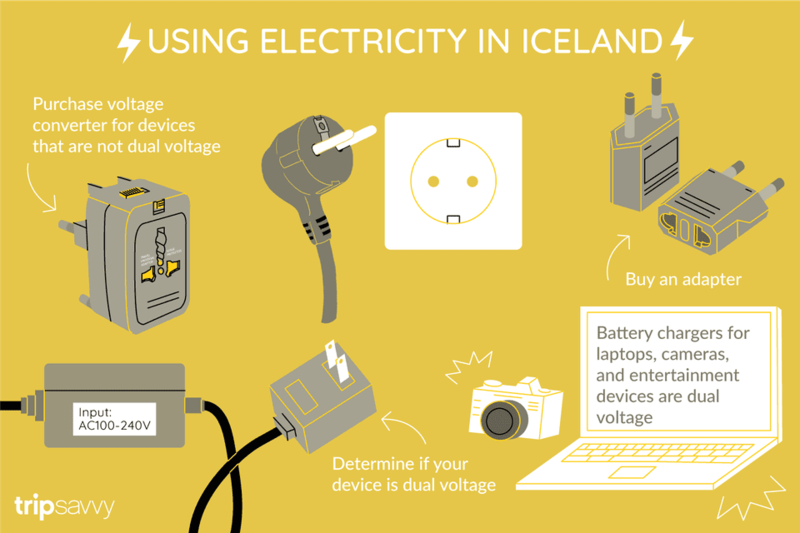 If you are planning a visit to Iceland and you need to charge your laptop or mobile phone, then the good news is that most of these devices can accept a higher voltage. In Iceland outlets output 230 volts versus in the U.S. where the output is half that. The plug will be different, so you will need a special electric adapter to fit your U.S. plug into the outlet in Iceland. You might need a converter depending on the device and the electric current that your device can tolerate. Electric devices in Iceland use the Europlug/Schuko-Plug (CEE types), also called "type F," which has two round prongs and two grounding clips on the side of the plug. It is not too hard to find out if you need an adapter versus a converter. To be sure, check the back of your laptop (or any device) for power input markings. If all you need is a simple adapter, then the power input marking should say, "Input: 100-240V and 50/60H," which means the device accepts variable voltage or hertz (and it can accept 230 volts). If you see that, then it means you will only need an adapter to change the shape of your power plug to fit into an outlet in Iceland. These power adapters are relatively cheap. Most laptops will accept 230 volts. If you plan on bringing small appliances, changing the shape of your adapter may not be enough. While most all personal electronics in recent years will accept both U.S. and European voltages, some older, smaller appliances do not work with the hefty 230 volts in Europe. Again, check the label near the appliance's power cord. If it does not say 100-240V and 50-60 Hz., then you will need a "step-down transformer," also called a converter. A converter will reduce the 230 volts from the outlet to provide just 110 volts for the appliance. Due to the complexity of converters and the simplicity of adapters, expect to find a big price difference between the two. Converters have a lot more components in them that are used to change the electricity that is going through them. Be sure before you plug into the wall using "only an adapter" that your device can handle the voltage. If you plug in, and the electric current is too much for your device, it could fry your device's components and render it unusable. Converters and adapters are available in Iceland at the duty-free store in Keflavík Airport as well as some major hotels, electronic stores, souvenir shops, and bookstores. If you are coming from the U.S., do not bring a hair dryer to Iceland. They are hard to match up with a suitable converter due to their high power consumption. It might be best to check if your accommodation in Iceland has one in the room, most do. Some swimming pools have hair dryers for use in changing rooms. If you absolutely need a hairdryer and your hotel does not have one, your best bet is to buy a cheap one when you arrive in Iceland.